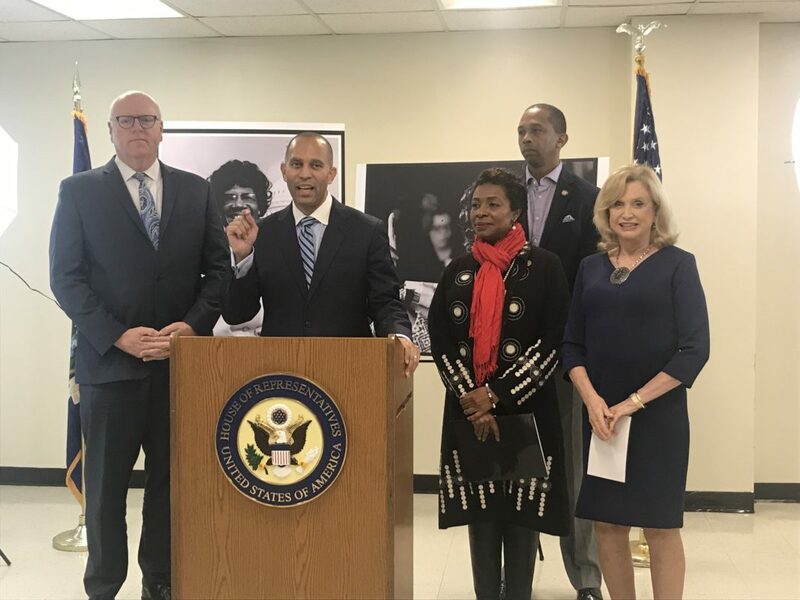 DOWNTOWN BROOKLYN— Members of the congressional delegation announced Monday, November 5, a bill to honor Shirley Chisholm, who 50 years ago was elected to Congress on this day. U.S. Representatives Hakeem Jeffries introduced bill H.R. 4856 to award Chisholm, posthumously, the Congressional Gold Medal. Joining him to commemorate the event were Yvette Clarke, Joe Crowley, Carolyn Maloney and Assemblymember Latrice Walker. Lawmakers made the announcement at 55 Hanson St., a state building downtown Brooklyn named after Chisholm. “The election of Shirley Chisholm was an incredibly important election for your community, for our city, for the Congress and for our country,” said Jeffries. “Shirley Chisholm was a dynamic trailblazer, a voice for the voiceless, a champion for children and families and a tremendous defender of social economic justice,” he added. Chisholm was born on November 30, 1924, to immigrant Caribbean parents. She first served New York as a member of the Assembly from 1965 to 1968. 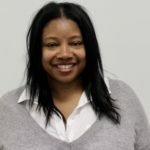 After her assembly run, she went on to serve seven terms in the U.S Congress representing the 12th Congressional district. She launched her campaign with the slogan: “Unbought and Unbossed,” a mantra still relevant today. “Shirley Chisholm’s labor and contribution to Brooklyn, Congress, our nation continue to bear fruit to this very day,” said Clarke who reminded the audience that she and Chisholm belong to the sorority group Delta Sigma Theta. “She has paved the way for many other women including me to run for elected office at all levels of government,” she added. 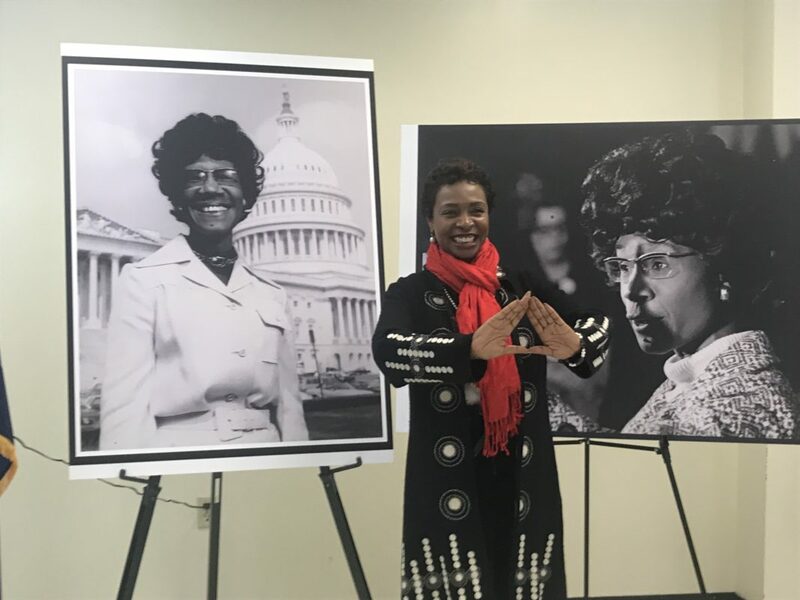 Congresswoman Yvette Clarke at the Shirley A. Chisholm building saluting the icon with a Delta Sigma Theta hand signal. Both are members of the sorority. Chisholm served on the Education and Labor Committee, and the Agriculture Committee. She was the first black women to serve on the House Rules Committee. By 1972 she was the first black candidate on a major Party ticket running for U.S. President. This is the first attempt to honor Chisholm with the medal. With 50 co-sponsors on board for the original bill, Jeffries is aiming for a supermajority, pulling more than half of the congressional delegates’ approval. Delegates will hold a ceremony in the Rotunda of the U.S. Capitol to which Chisholm’s family will be invited along with dignitaries and the President of the United States. The U.S. Mint mills the congressional medals, bronze duplicates will go on sale to the general public. “It’s a really, really big deal and a big thing,” said Crowley. Cheers to the memory of that classy public servant!